NRGI’s Resource Governance Index measures good governance in the extractives sectors of 81 countries. This year, Mongolia’s mining sector ranked 15th out of 89 assessed extractive sectors, with an overall score of 64 out of 100 points—a relatively satisfactory result indicating that progress has been made in some areas of resource governance. Good governance of extractives is a critical precondition for sustainable development in resource-rich countries, and Mongolia would do well to use the RGI’s findings as a roadmap in its efforts to plan and implement necessary reforms. A half-full or half-empty glass? Global indices like the RGI often provide a single overall country score that is a composite of many component and sub-component scores. While there can be many merits to this approach, a composite score might conceal problem areas if the relative significance of sub-components is not properly captured, or if scores for some well-performing indicators sharply contrast to those for problematic areas. The RGI’s assessment of Mongolia provides a clear example of the latter, and it is worthwhile to explore issues that are obscured by Mongolia’s satisfactory overall score. Mongolia’s results are mixed: the score indicates that the country has strong governance procedures and practices in some areas, but needs improvements in others. The RGI measures governance across three components. The first is value realization, which covers issues related to licensing, taxation, local impact and state-owned enterprises—factors determining whether a country gets an expected return for the use of its resources. The second component is revenue management, which covers issues related to government budgeting, subnational revenue sharing and management of revenues through different wealth funds. The third component draws on pre-existing measures of governance and assesses a country’s enabling environment—the extent to which the country creates an environment conducive to transparent and effective policies. 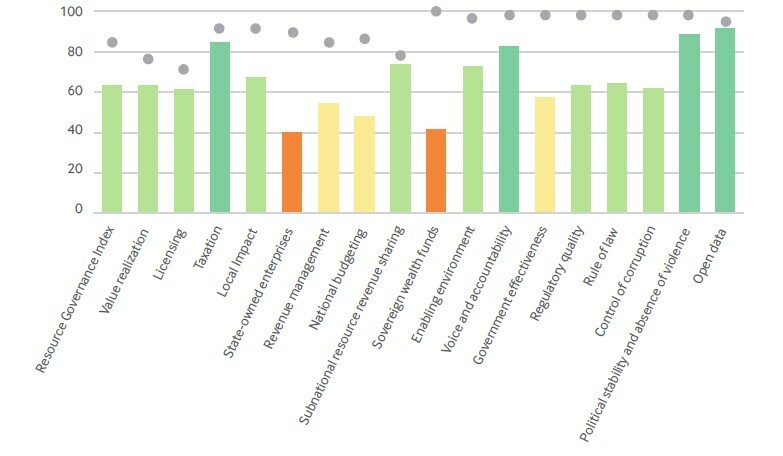 While Mongolia scored relatively well on the enabling environment component (73 of 100), its scores for revenue management (54) and value realization (63) indicate that there is much room for improvement, especially on the two components that are directly related to the benefits the country derives from its extractive industries. Digging deeper reveals even more discrepancies among sub-components (see Figure 1). For instance, the lowest sub-component score is for state-owned enterprise governance (40), while the highest score is for open data policies (92). The 52-point gap between the two sub-component scores highlights the need to take a more holistic approach to strengthening extractives governance. The key issues impacting good governance of the sector are highly interrelated. Indeed, even one unaddressed issue may result in the failure of the overall policy. Notes: Dots represent global maximum scores for each component. Dark green, light green, yellow and amber indicate good, satisfactory, weak and poor performance, respectively. The RGI reveals a big “implementation gap” between rules related to extractives governance and the practice of implementing these rules. On average, the score for all legal frameworks assessed by the RGI (54 of 100) exceeds the score for practical implementation (45). This gap is even larger for Mongolia—20 points. Weak implementation of policies and laws has always been a challenge for Mongolia. Sayings like “Mongolian laws last three days” are well known, even by school children. The RGI confirms what many Mongolians already know. The enforcement of laws and regulations related to transparency and accountability is especially weak. The Glass Account Law or Open Government Partnership commitments are just two examples. Public demand for greater transparency and accountability in the Mongolian mining sector has led to many reforms in the past two decades. Such progress—including the implementation of the Extractive Industries Transparency Initiative—has positively impacted Mongolia’s overall RGI score and contributed significantly to the volume of extractives-related information people can access. Despite its strong overall score, the devil is in the details. The government needs to keep working to increase transparency and accountability. One key area of concern revealed by the RGI is the governance of state-owned enterprises, in particular that of Erdenes Mongol, the largest state-owned holding company. This company holds the country’s strategic mining assets; good governance of Erdenes Mongol can have a profound effect on the wider economy. However, at present, the company does not make essential information (such as annual financial reports) publicly available, and it ranks quite low in comparison to similar entities in other countries. Unlike governance challenges that depend on factors beyond a government’s control such as commodity price volatility, reform of state-owned enterprises largely depend on the existence of political will. Mongolia’s mining revenue management can be improved via prudent budget spending and better sovereign wealth fund management. The government devised the Fiscal Stability Fund and the Future Heritage Fund for this very purpose, but both bodies still exist purely on paper. As indicated by high deficits and the threat of defaults, the government budget remains unstable. Mongolia has not managed to conserve portions of its mining revenues for future generations, which is a result of politically motivated spending and shrinking revenues. Rules governing these funds change much too often, and there is little publicly available information or scrutiny on these funds’ policies. Extractive company beneficial ownership disclosure and improved transparency around extractive contracts are two other needs. The former is a relatively new challenge that, if addressed effectively, can help end ownership anonymity, build trust with the public, and prevent tax evasion and corruption. The latter is a long-standing challenge in Mongolia. Both these issues are also a part of Mongolia’s commitments under the OGP and EITI. Most importantly, these reforms would both lead to a more level playing field for investors and ensure that the benefits from the sector trickle down to all Mongolians. This entry was posted in Dorjdari Namkhaijantsan, Global Indices, Mining, Mining, Mining Governance. Bookmark the permalink.